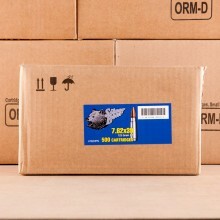 7.62x39 AMMO IN BULK SHIPS FOR FREE! The Soviet Union designed 7.62x39mm ammunition during World War II for initial use in the SKS Carbine Gun. Today, 7.62x39 rounds are most commonly fired by AK-47 shooters at the range, used by some North American hunters in the field and still relied upon for military use in China, North Korea, Venezuela and Finland. 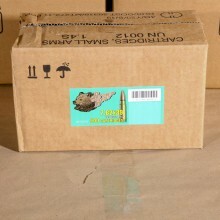 We offer a wide assortment of ammo for sale that's perfect for your AK-47. 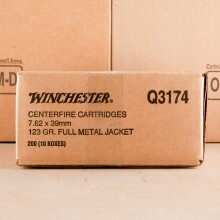 From light-weight 122 grain cartridges to slightly heavier 124 grain bullets perfectly suited for the range. 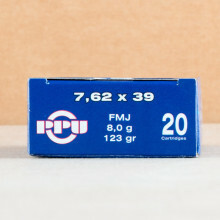 Additionally, we strive to keep both full metal jacket (FMJ) and hollow point rounds in-stock so you can get exactly what you need for your rifle. 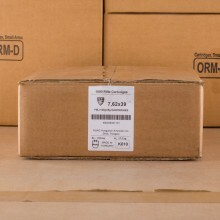 With a healthy supply of surplus ammo as well as great rounds from top brands like Wolf and PMC, you can rest assured you're getting a great round, with fast shipping from AmmoMan.com. If you’re looking to do some plinking with an AK-47, odds are just about any full metal jacket bullet type will fit the bill. AK-47’s are notorious for being able to reliably feed and eject just about anything. 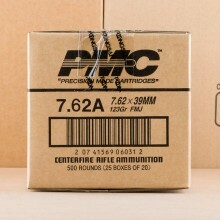 So much so that many shooters joke that they could use gravel as ammunition and their rifle would function flawlessly. 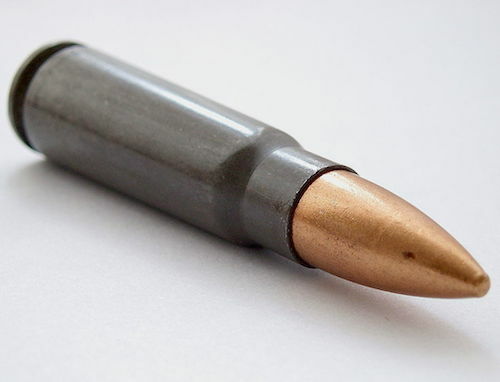 If you’re looking for a bullet that will expand upon impact with your target, you would be smart to reach for jacketed hollow point (JHP) rounds. 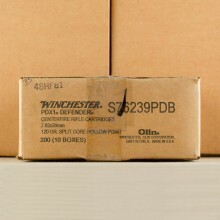 Not as common and slightly more in terms of investment per round, hollow points are designed with an expanding bullet. This expansion ensures the maximum amount of damage in your target as well as energy transfer to your target. Most 7.62x39 bullets weigh-in at about 122 grain. 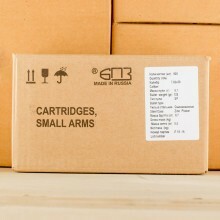 These rounds will travel just under 2,400 feet per second from the muzzle and offer a muzzle energy of about 1,555 foot-pounds. 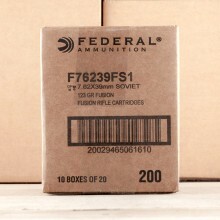 Heavier rounds like 154 grain bullets will travel slightly slower and offer about 2,100 feet per second of muzzle velocity. 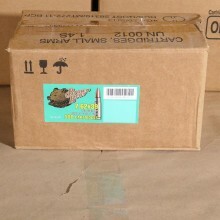 Wolf and Tula are two of the largest manufacturers of 7.62x39 ammo. 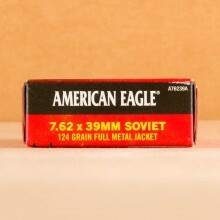 These two companies offer primarily Russian ammo, which makes sense given the AK-47’s Russian roots. 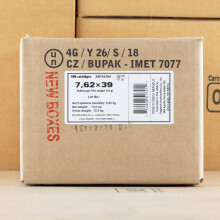 While Wolf and Tula are typically steel-cased, you can also find quality 7.62x39 rounds with brass cases by well-known and respected companies like PMC, Federal, and Sellier and Bellot. 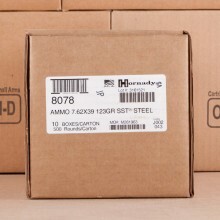 Because of the AK-47’s popularity across the world and somewhat notorious reputation for being the weapon of choice for many of the United States’ armed enemies, the 7.62x39 caliber is popular among American shooters looking for a military-grade round that’s cheap. The round’s value goes beyond vanity, however. Hunters also use the round for taking down game up to the size of whitetail deer and the round is nearly as powerful as the 30-30 caliber, which is also very popular in hunting cirlces.